The right information. In the right words. At the right time. In the right place. Not according to what you think. We help you find out what your users think is right. If people can’t find what they’re looking for fast, they’ll leave your website within seconds of arriving. Your website has to cater to your users’ needs and expectations. It has to be structured according to their logic. In their words. Only then will they stay. That’s why we base our proposals for a new structure on user research. Because really, it’s all about them, isn’t it? We make sure your information is easy to find, easy to understand and easy to use. On every level of your website. We draw up the structure of your website. We separate content which is essential from that which isn’t. We weed out useless pages and add information where needed. The result is a flexible and transparent structure that can easily accommodate new information. We don’t stop at the tree structure or sitemap. Those are important tools to visualize your information’s hierarchy. But they don’t tell the whole story. That’s why our structure also indicates which paths users can follow to find what they’re looking for. Other than the hierarchical one. That way, we create a solid information architecture that allows the user to access information in various ways. A good information structure uses the right words: the ones your customers use. We write menu items, page titles and links your users can understand and relate to. Just a hint: exotic abbreviations and product names are usually a big no-no. You can’t automate the process of information architecture. Every structure is different. And no single expert has all the answers. There’s only one way to find out if your users can find their way in the new structure: user testing. Problems discovered in this stage are quite easily fixed. If you only find out after the development or – heaven forbid – the release, those same problems would cost a lot more time and money to fix. 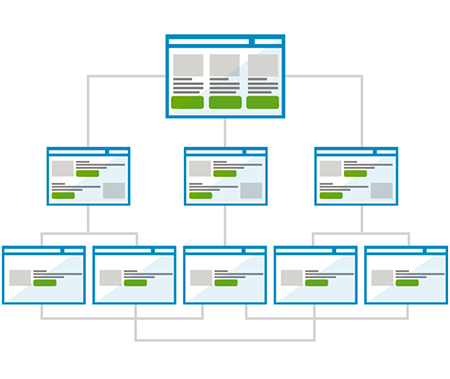 Armed with your information architecture, we make sketches for all your website’s page types. These wireframes and prototypes make clear which information goes where.